This Puzzle Games Glossary at gamerisms describes the popular games of Sudoku, Rubik’s Cube, Crossword Puzzles, Bejeweled, Deal or No Deal, Twist Me Silly, Chuggles and Jungle Bubble Skill Games. A glossary describing types of puzzles follows. There is a listing at the end and to the right of the puzzle games glossary for the 5 most popular games as rated by gamerisms. has his or her favorite. There are games that have been around for centuries and there are contemporary games that have proven to be tremendously popular puzzle games online and off. Let’s take a look at some of them. The Japanese Sudoku game is a game that involves only numbers. Players are given a series of cells that need to be filled in with specific numbers. They are offered a series of blank cells with nine vertical cells and nine horizontal cells. The nine-cell by nine-cell grid holds 3 x 3 areas that also offer blank cells that need to be filled in. The player of Sudoku is offered some numbers within certain cells, identified as givens. The givens are used by the solver to determine where other numbers are supposed to go in the remaining blank cells. The skill challenge of Sudoku puzzle games is to fill in all blank cells so that all rows, columns, and 3x3 regions contain all numbers ranging 1 through 9. The player is only allowed to use one number per blank cell. The Rubik’s cube was designed by a professor and sculptor and is a cube-like puzzle with rotatable sides. The cube has six different colors, and when the cube is mixed up, the skill challenge is to rotate the different sides of the cube in such a way that the color patterns align with one another. Some solvers take theses popular puzzle games to a new level by trying to solve it in a way that uses the fewest moves possible, or in the fastest time possible. Crossword puzzles are beloved by many as this type of popular puzzle or word game offers the puzzle solver clues that are hints to the words and letters that belong in specific numbered boxes, rows and columns. When one word is completed, the letters from that word can be used to assist the solver with other portions of the puzzle. Brain teasers are games that require the puzzle solver to think in new, innovative, or unusual ways. People love these types of skill puzzles because it forces the brain to work in ways that it normally does not during average situations. Abstract thinking is sometimes necessary and the solver must cast aside assumptions when attempting brain teasers. There are many puzzles available online. It would be impossible to list them all as there are literally hundreds of puzzles. We list a few of the most popular games. Bejeweled: is a game online for playing immediately or players can download the game and play it on a home computer. Bejeweled offers hours of fun as the player attempts to group specific jewels or gems together. The game is timed in many instances so the solver needs to work as quickly as possible. Bejeweled is challenging because two adjacent gems must be swapped in terms of positioning in order to group the gems together correctly. The gems must line up horizontally or vertically; when gems are properly grouped, then the player will see those gems disappear and new gems will fall into place for more group creations. For this game, the player is presented with diodes that have to be connected together. The diodes light up and when combined correctly, explode and disappear. Similar to Bejeweled, this game moves more diodes into position when diodes are aligned correctly and disappear. These adorable puzzle games are filled with fuzzy round creatures that look like pom-pom balls with eyes. These creatures are different colors and need to be aligned by dragging the mouse across the screen to move them. Once the colors of three or more Chuzzles match, the player hears the Chuzzles squeak and sees them disappear. More Chuzzles fill in the remaining gaps as the matching game continues. The TV game show comes to the internet and stars as a popular puzzle game. The player attempts to wipe out low valued prizes so that he or she can try to get the big prize. The player is presented with several briefcases to choose. The prize values are revealed when the cases are selected and opened. Briefcases only open one time, thus the goal is to try to wipe out lower valued briefcases before the high valued briefcases close. The player of Jungle Bubble is presented with bubbles of different colors that must be shot at with a stick. The player is challenged in terms of aim and speed, and must learn how to make bounce shots work in order to bust the appropriate bubbles. Antique Puzzles: This term is used to reference jigsaw puzzles that were created before the year 1890. C Cut: Puzzles and pieces that have a C cut shape which interlocks. Combination Puzzles: Combination puzzles are those identified as sequential. They have several pieces that are moveable and the solver can move the pieces around in order to group them in a specific manner. Example: Rubik’s Cube. 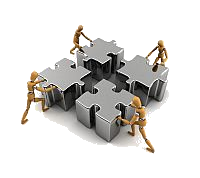 Construction Puzzles: Require the puzzle solver to utilize specific pieces in order to design a particular outcome. Tiling, stick, and mechanical puzzles are considered types of construction puzzles. Contour Cut: Refers to jigsaw puzzles and describes a piece that has been cut to follow along the natural contours of an object in the image. Example: Puzzle with an image of the United States. Disentanglement Puzzles: With this type, the puzzle solver is required to get two or more pieces separated. Some puzzles challenge the solver to put the puzzle back together as well. Folding Puzzles: Similar to the practice of origami; the solver seeks to fold a piece of paper in a particular manner so that a specified portion of that paper appears in the specified location. Impossible Object: In puzzle lingo, an impossible object is a puzzle that will either not be easily disassembled or it is seemingly impossible to solve. This creates a challenge to the solver. Innies/Outies:Slang term used to describe jigsaw puzzle pieces, both those with tabs than those without. Lock Puzzles: Puzzle boxes or other puzzle forms where the solver is challenged to uncover a secret. Lock puzzles require special maneuvers in order to unlock the puzzle in order to be solved. Logic Puzzles: Rely on the implementation of mathematical deduction in order that the puzzle can be properly solved. Mechanical Puzzles: Include the use of several pieces that are movable/interlinked. The solver is then challenged to discover the precise pattern that the puzzle uses to be returned to a specific state. Example: Rubik's Cube. OB: This term is used to describe the condition of a jigsaw puzzle box. The actual term means "original box." S Cut: Describes jigsaw puzzles and is used in reference to pieces that have two adjacent C cuts--one forward and one in the opposite direction that in turn, create locks on two sides of the jigsaw cut. Vintage: jigsaw puzzles that were created between the years 1900 and up to World War II. Whimsies: This term is used to describe some of the more ornate shapes in a jigsaw puzzle. includes Pencil games with examples plus Popular and Classic games described. include Word Battle, Anagrams and a Word Games Glossary.